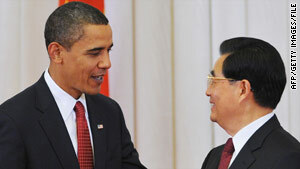 President Obama and Chinese President Hu Jintao, here in Beijing in November, chatted by phone Thursday night. (CNN) -- President Obama and Chinese President Hu Jintao spent an hour on the phone together, discussing key issues in the complicated relationship between the United States and China. The White House emphasized nuclear issues in its description of the phone call Thursday night, while Beijing focused on economic ones. "President Obama welcomed the decision by President Hu to attend the upcoming Nuclear Security Summit, which will be an important opportunity for them to address their shared interest in stopping nuclear proliferation and protecting against nuclear terrorism," a White House statement said. "President Obama underscored the importance of working together to ensure that Iran lives up to its international obligations." Economic issues proved to be the focal point in coverage provided by China's state-run media -- something the White House mentioned at the end of its statement on the phone conversation -- and point to the differing priorities of the nations. "Healthy and stable economic and trade relations between China and the United States serve the interests of both countries," Hu said Friday, according to the Xinhua news agency. "As uncertainties still remain in the global economic recovery, both China and the United States face the task of boosting the economic recovery and maintaining stable economic development," he said. The prickly topics of Taiwan and Tibet top nuclear issues in state-run media coverage. Washington has drawn China's ire for recent weapons sales to Taipei and a controversial meeting between Obama and the Dalai Lama, the Tibetan spiritual leader. Properly handling the Taiwan and Tibet issues, which represent China's core interests, is key to the Sino-U.S. relations, Hu said, according to Xinhua. China's coverage pushed nuclear discussions to the end of its story on the trans-Pacific phone call. Hu announced Wednesday that he would attend the Nuclear Security Summit in Washington on April 12-13. Obama has invited more than 40 nations to participate in the event. Susan Rice, U.S. ambassador to the United Nations, also said this week that China agreed to negotiate possible sanctions against Iran. But Chinese officials were not as bold in their statements Thursday, again emphasizing the difference in priorities. Foreign Ministry spokesman Qin Gang said that he hoped the issue could be solved "through diplomatic negotiations." "We oppose Iran's possession of nuclear weapons, and at the same time, we also believe that as a sovereign state, it has the right to peacefully use nuclear technology," the spokesman added. The United States and its allies suspect Iran is trying to develop nuclear weapons, while the Iranian government has said it only wants a peaceful nuclear energy capability. Rice said there was little doubt that Iran wanted a nuclear weapons capability. "All of the evidence indicates the program is not as they state, for peaceful purposes only, that there is a military element to it," Rice said this week.